The challenge, as Towner once spelled it out “was to develop the idea of embracing the interaction of a small group on the guitar itself.” Three lines of influence converged in his work: Evans’s conception of jazz, Brazilian music – a major inspiration for Towner in the 1960s - and classical guitar. “Over the years I kept on adapting each of these in my own way. I abstracted them and modified them until the sources were no longer recognisable, and I’d arrived almost without noticing it in an idiom of my own.” The Towner idiom was further extended with the 12-string guitar, on which experiments with different tunings led to evocative sonorities and atmospheres. On the new album, the 12-string is the vehicle for the mysterious “Clarion Call”, as well as the hovering miniature “Biding Time”. Amongst other striking pieces, “Blue as in Bley”, is a soulful tribute to Paul Bley, who had died a month before the session. Whether on classical guitar or 12-string guitar, Towner’s touch is immediately identifiable. As fellow guitarist Scott Nygaard has noted, “No one else plays guitar like Ralph Towner, And while his compositions often sound ‘classical’ (combining a fondness for Baroque voice leading, Stravinskian harmonies, and odd time signatures with his own strong sense of melody) that’s primarily because each piece grows organically and gracefully from an initial idea.” Towner’s feeling for form has been a consistent strength, as two older compositions - “Shard” and “Rewind”, both from the early repertoire of Oregon – confirm here. 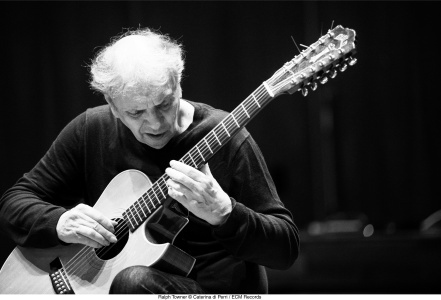 A key ECM recording artist for 44 years, Ralph Towner was born into a musical family in Washington in 1940. He began playing piano at age 5, followed by trumpet two years later. He launched his jazz career as a Bill Evans-inspired pianist, then travelled to Vienna to study classical guitar with Karl Scheit, the renowned Austrian guitarist, lutenist and teacher. In New York City in the late 1960s, he freelanced on both piano and guitar, before co-founding the band Oregon in 1970, with Collin Walcott, Glenn Moore and Paul McCandless – all of whom would appear on his ECM debut, Trios/Solos, in 1972. Towner’s recordings for ECM have included solo albums, duo projects (with John Abercrombie, Gary Peacock, Gary Burton and Paolo Fresu), bands under his direction (including Solstice with Jan Garbarek, Eberhard Weber, Jon Christensen) and discs with Oregon. Towner has also contributed to outstanding albums by Keith Jarrett (In The Light), Jan Garbarek (Dis), Kenny Wheeler(Deer Wan) and Egberto Gismonti (Sol do Meio Dia). In the last few years activities have included many concerts with Sardinian trumpeter Paolo Fresu, their album Chiaroscuro garnering much positive press along the way (“Lushly resonant guitar and stately trumpet, a masterful match of color and texture” – The Village Voice). Another important association is with the guitar trio with Austria’s Wolfgang Muthspiel and Kazakhstan-born Australian player Slava Grigoryan. “Three guitarists from three different continents with three very different disciplines unite for this breathtakingly beautiful trio outing,” wrote Down Beat of the album Travel Guide.